Round 3: Rockhold takes mount and cuts Weidman wide open. Rockhold is UNLOADING at the end of the round and the champ is barely defending. He somehow makes it to the end of the round! WE HAVE A NEW CHAMPION!! Rockhold wins after the referee steps in due to strikes. Up next? 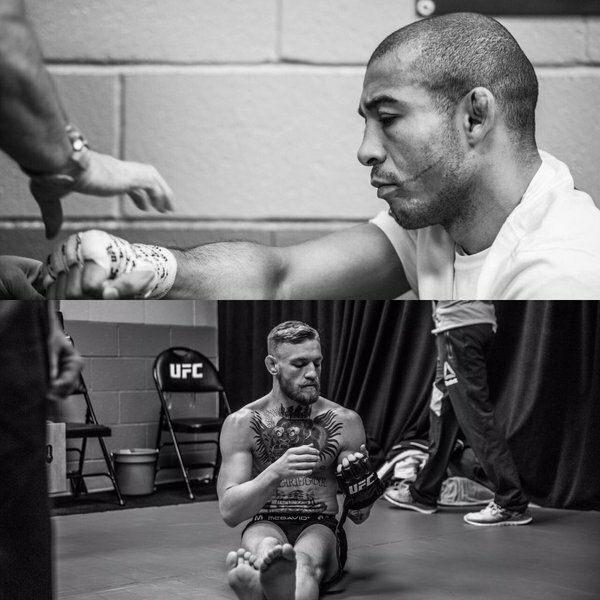 The big one, it's finally here, McGregor vs Aldo. Champ vs Interim Champ. Pound-for-pound king vs the king of the mic. Enough hype for you? Weidman, towel on his head, just wheeled past us on a stretcher. "Ole ole ole" bursts out around the arena. Round 1: It's already over!!! McGregor wins by KO in 13 second!!!! This is unbelievable! Blink and you'd have missed it! Aldo is out cold! That is absolutely unbelievable, McGregor may have to change his ring name to "ONE PUNCH"!! Aldo is in utter shock, and looks furious at the fact he's lost. Don't fear the many who has to bring him back to reality with the reminder of what happened.